Another visit to a wonderful garden, The Round House in Ilfracombe. It was as spectacular as ever, with its steep paths winding through borders stuffed with a myriad of horticultural splendors and views to the sea beyond, and it has been tricky to decide which plant to feature. It would have been too obvious to feature the apricot, crimson and baby pink rhododendrons, or the exotic Geranium maderense dripping over the paths throughout the garden, or cut-leaved acers in gold and blood red, or the metallic shine of Elaeagnus “Quicksilver”, the ever flowering Fuchsia splendens, or even the sky-high embothrium and its slightly smaller offspring in full scarlet flower. 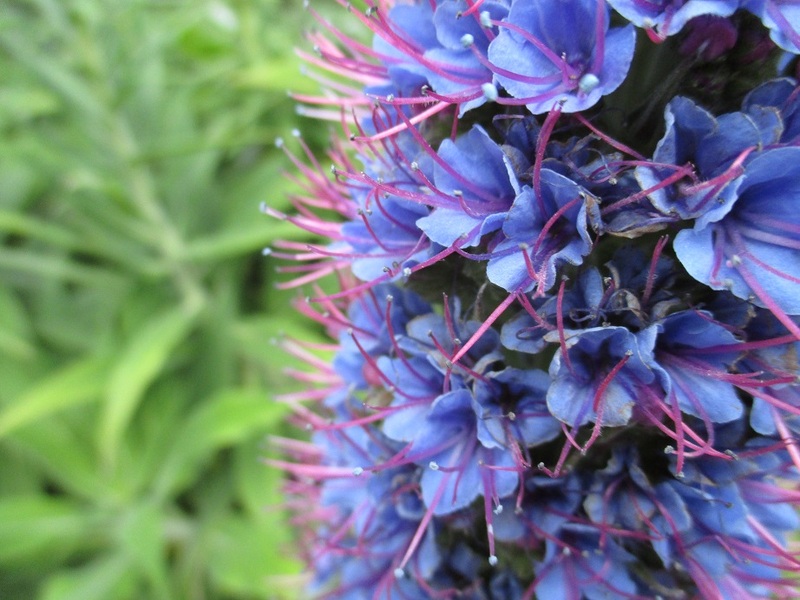 Instead I will show you Echium candicans; the perennial, bushier, multi-headed sister of the statuesque Echium pininana. With flowers of gentian blue, contrasting with deep pink stamen it is as popular with bees as its fellows. It is also very popular with me. So, using all my powers of autosuggestion, coercive persuasion, the Vulcan mind meld and some delicate intimation I managed to obtain some cuttings. It went something like this “I read last night that you can successfully take cuttings from this echium, as long as they are taken now, I mean right now, just this very instant.” Big Hollywood smile, whilst saying “hint, hint”. And it worked! I came home with a plastic bag of bounty. They are now safely in place and I am using my new-found psychic abilities to assist in the rooting process. It must of course be mentioned that the morning was further enhanced by the lovely hosts, a special guest appearance from my old (less of the old) friend Hero and some delicious lemon drizzle cake. It’s a hard life, but someone’s got to do it! I knew I wouldn’t have to wait long for a feel-good-fix (after yesterday’s carnage). A much less painful day! Oh you are very persuasive Gill, I wonder if I could use such tactics at work? Good luck with rooting the cuttings! I hope that they come good for you. Oh how lovely, good luck with the cuttings. What an amazing skill to have, this Vulcan Mind Meld thing. I must see if I can learn it. A wonderful garden to visit and some cuttings as a bonus to take home, my idea of a ‘Grand Day Out’ – you will know! Indeed 🙂 How are your cuttings coming along, all grown up yet?